A lifestyle medicine evidence review was conducted by the American College of Preventive Medicine in 2009. 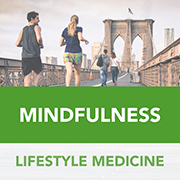 It compiled the scientific evidence that supports the need for increased competence in lifestyle medicine among healthcare providers and predicted an increased demand for training in delivering lifestyle interventions. It argued that greater provider competence might lead to improved patient outcomes. The review noted the lack of knowledge among providers in major elements of lifestyle medicine, such as stress reduction and emotional wellness, the role of these modalities in health, and a lack of comfort in prescribing interventions to address these modalities.